How crucial is the FBI’s International Response Unit? Has the Criminal Minds: Beyond Borders TV show been cancelled or renewed for a third season on CBS? The television vulture is watching all the latest TV cancellation and renewal news, so this page is the place to track the status of Criminal Minds: Beyond Borders season three. Bookmark it, or subscribe for the latest updates. Remember, the television vulture is watching your shows. Are you? 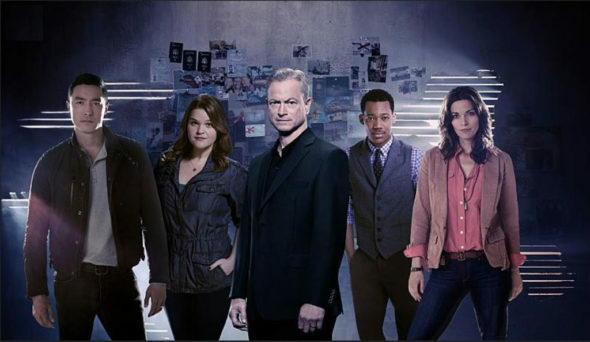 Airing on the CBS television network, Criminal Minds: Beyond Borders stars Gary Sinise, Alana De La Garza, Daniel Henney, Tyler James Williams, and Annie Funke. Sherry Stringfield, Brittany Uomoleale, Kelly Frye, Ezra Dewey, Declan Whaley, and Matt Cohen recur. The procedural series features the International Division of the FBI which investigates crimes and rescues Americans in peril, abroad. International Response Unit Chief Jack Garrett (Sinise) is a 20-year veteran of the Bureau. His crack team includes multi-lingual cultural anthropologist Clara Seger (De La Garza). There is also military hero and expert profiler Matthew Simmons (Henney). Russ “Monty” Montgomery (Williams), is a gifted tech analyst who additionally works with the families of those in trouble. Finally, there is the funny but fierce medical examiner, Mae Jarvis (Funke). The unit zealously works to bring U.S. residents safely home, by profiling and identifying criminals who are beyond our borders. The second season of Criminal Minds: Beyond Borders is averaging a 0.82 rating in the 18-49 demographic and 4.92 million viewers. Compared to season one, that’s down by 34% in the demo and down by 29% in viewership. Find out how Criminal Minds: Beyond Borders stacks up against the other CBS TV shows. On May 15, 2017, Criminal Minds: Beyond Borders was cancelled so it won’t return for a third season. Could it be revived somehow? Stay tuned for further updates. Criminal Minds: Beyond Borders got off to a so-so start and the ratings dropped from there. I suspect this CBS series will be cancelled. Be sure to subscribe, to stay up-to-date on the ratings fluctuations this television vulture is watching, as well as any cancellation or renewal news. Find more Criminal Minds: Beyond Borders TV series news or other CBS TV show news. What do you think? Are you sorry that Criminal Minds: Beyond Borders has been cancelled? Do you wish it had been renewed for a third season? I was so happy there was a season two. This should not be cancelled! I enjoy suspence. I am 66 and I love the show. I can not stand shows that you don’t have to think about. Give me drama and suspense any day over comedy. Such a great show with relevant topics, good acting. Why don’t people over 50 count??? Maybe if you put it in a different time slot and day! I think it deserves a third season! My cell cut out my part of my word ( Bear’s!!) in my previous post below. Just wanted to add that in. But in all seriousness, bring BK our CMBB!! Please renew criminal minds beyond border. I love Gary sunrise and I love the show. Bring it back & get rid of the reality shows. Great show! Love Gary Sinise! Good story lines, character development, and makes me feel less afraid to travel outside U S.
That is such a shame, I really like this series! I am so disappointed about this show being cancelled after 2 seasons! I really like the show and took place of Criminal minds. I just can’t believe that show didn’t get good ratings! I think it’s better than the original Criminal Minds. You need to cancel the reality shows! Please, please do not cancel this show!!!!! !